Or will their lies destroy them all? From Goodreads. I received this eProof for free from Simon & Schuster Children's Books via NetGalley for the puposes of providing an honest review. Trigger Warning: This book features child abuse: domestic violence; an abusive relationship: controlling, manipulating, gaslighting and stalking; bullying, violence, discussion of suicide, and suicide ideation. This Lie Will Kill You by Chelsea Pitcher sounded like the perfect mystery. An exclusive murder mystery party that is a set up to uncover a murderer? It sounded so good! However, it just really didn't work for me. But let's talk positives first. There are the five main characters, Juniper, Gavin, Ruby, Parker and Brett, and the book is told from each of their perspectives. Then there's Shane, the boy who was murdered, who makes an appearance in a number of flashbacks. And finally, there is the person who is behind the murder mystery party. All of the five main characters played a role in what led to Shane's death, but who murdered him? Was it all of them, some of them, or just one of them? And what actually happened? Because, mostly, there's just been rumours about each of them. So what is the truth? This story is well plotted. There were moments at the very beginning where I thought it was obvious who was behind the party and who the murderer was, but This Lie Will Kill You is scattered with red herrings and twists and turns. We're only given details about certain things in drips and drabs, so before I know everything, I thought, annoyed, "Oh, well, this person is obviously the killer!" only to find out later that the characters were thinking about something else entirely. So I never quite new what was happening; who did what and why. And despite my huge issues with the book, I had to know what happened, and had to keep reading. So in the case of the mystery, I was pretty hooked. Until I got to the end, where there were elements I was squinting at, but I'll get to that later. This Lie Will Kill You is also pretty diverse. Juniper is Latina, and Gavin is East Asian - we're not told anything more specific. But I don't know that for sure. There is a girl who is in love with another girl, but there are hints that she may also be bisexual, and there's a boy who's in love with another boy. Now the negatives. There is so much melodrama, and it was so unrealistic. In a flashback moment of how Parker and Ruby's relationship came about, after Parker has thrown a boy who was being insulting to Ruby into a trash can, she takes his hand, puts it on her chest, and says something alone the lines of, "Do you feel that? My heart is beating for you." During the present day, at the murder mystery party, Parker tells Ruby - who are no longer to together - "I would die a thousand deaths for you." There is talk of "the greatest love of my life," and "you are a goddess in a world of pyramids and sand." And it goes on and on and on. Ridiculous and over the top declarations, and thoughts that people just don't think unless they're deluded or in an old timey book or movie. At first it was embarrassing, and then it just got annoying. I may not be a teenager any more, but I was one, and no-one talks like that! And these guys are 17 or 18, in their senior year of high school. It may have been more believable if they were younger, but even then it would be a stretch. I just wanted to put the book down so many times, because it just felt like bad writing. Who would think this is how teenagers talk? And along similar lines, I need to talk about Parker. Parker is terrifying. He is just so dark and twisted. At first, I thought he was just a pathetic guy who couldn't get over losing his girlfriend and wanted her back. But pretty quickly I realised that he was obsessed with Ruby. Nothing I mention here is a spoiler in regards to who killed Shane nor who is behind the party; everything I mention is who Parker was before Shane ever came on the scene. He is manipulative, and controlling. Before they split up, he would be wherever Ruby was. She had tried to split up with him a number of times, but he just wouldn't let her go; turning up at her house, playing with her sisters. And he would make Ruby doubt what she thought; "He's such a good guy, maybe I'm wrong to end it with him?" And at the murder mystery party, everything he does is in an attempt to get Ruby back. He is rich and entitled; he doesn't need the scholarship prize money, he's just doing it because Ruby will be there, and he wants to get her back. Every move is calculated - before and after everyone realises that the party is not just a party. He will do whatever it takes to get Ruby back, because she is his. She belongs to him. And it doesn't matter whatever it is he has to do, because the end result is what's right, is how things are meant to be, and he will be the hero, the white knight, and Ruby will realise how much she loves him. Mate, he is so sinister, and even more so because he doesn't seem to realise what he's doing. He knows the things he does to reach his goal aren't that great, but he doesn't seem to get that Ruby can make her own choices and she doesn't want to be with him. It's just so messed up. And to be honest, he's like that with his supposedly best mate, Brett, too, manipulating and controlling him. It's just awful. But here's where the problem is; in some moments, I'm not entirely sure if he's meant to be as terrifying as he is - is this Parker being really dark and obsessive, or is this more melodrama, like with everyone else? That line is blurred, because no-one acts naturally. Don't get me wrong, Parker is absolutely meant to be someone we abhor, someone who should be in jail, but when other people are making ridiculous declarations, as well, I couldn't always tell is Parker was being obsessive or melodramatic, and how we were meant to see the reader in those moments. Did Parker genuinely love Ruby as well as being terrifying (melodrama), or was it all part of him wanting her to belong to him again (obsession)? Then there's the story itself, which felt a little far-fetched in places. There were certain instances - in the lead up to Shane's death, and during the murder mystery party - that just felt really unrealistic. Things that I felt just wouldn't happen. While they were needed for the mystery element, they also made the mystery seem kind of ridiculous - so although I needed to know what happened, I was finding it less believable the more I read. I also thought there were a number of holes in the story in places - both in regard to after Shane's murder and the end of the story; police can look at forensics, and while I am absolutely no expert in such things, I'm pretty sure a murder mystery party wouldn't have actually been needed to figure out who killed Shane, and also, the story wouldn't end where the book ended, because, due to certain things I can't talk about, I'm pretty sure the police could work out what had happened. So it wouldn't have been over and finished. And then there are questions over the logistics to the murder mystery that I have certain questions over. It's a pretty epic, and would have taken a lot of planning, and there are just certain things I don't think could have been arranged as we're told they were. So with being far-fetched, there being plot holes, and logistical questions, even without all the melodrama, it would have been pretty hard to believe. 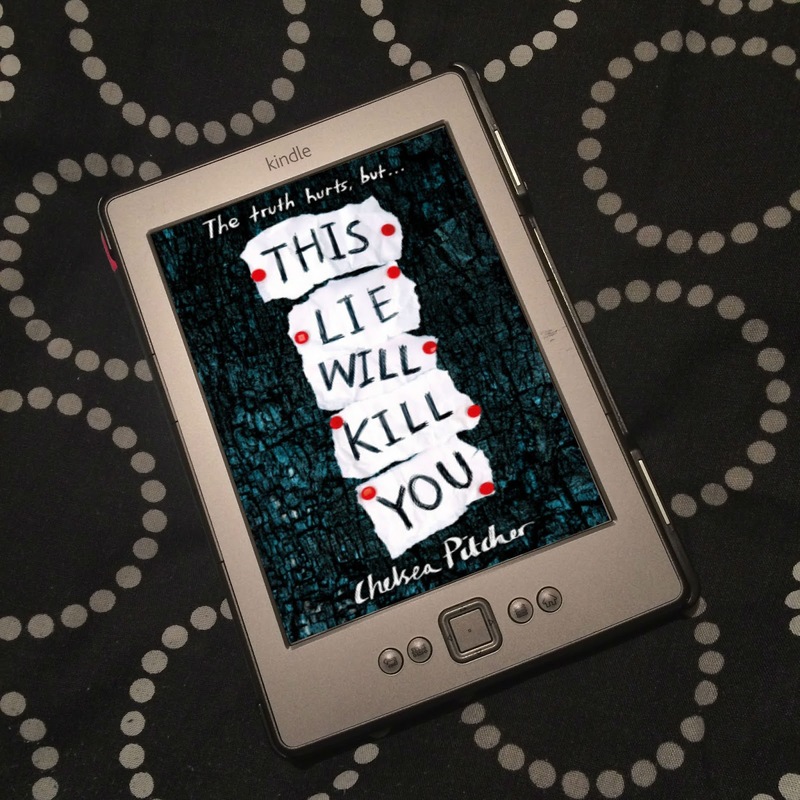 This Lie Will Kill You wasn't for me, sadly, but a quite a few other people have really enjoyed it, so do read some other reviews before deciding whether or not to read it. Thank you to Simon & Schuster Children's Books via NetGalley for the eProof.